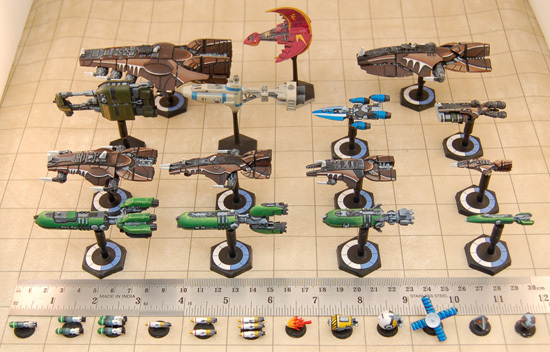 Between the Marauders and Alliance of Kurak there are a whole host of ships to make a pirate or rogue trader fleet. The Ba'Kash from the Zenian League could be added to that too. That's perhaps using a few too many ships for a single faction though. Well assuming new people pick up the game, more and more people won't already have GW ships hence the point of needing a proxy/conversion parts list. At least untill we get some nice sculpters to make some non-ip specific space cathedrals and the like. Gothic is a style and can't be copyright/trademark. So far he's mulling the situation over, but I really think he should strike while the iron is hot. Someone suggested using Drop Zone Commander Scourge Flyers as Necrons. Damn clever of them I say. Those corsair fighter look pretty good for escorts, theyre pretty expensive tho whicbh is saying alot coming from a GW gamer . Some nice looking minis here: http://www.kallistra.co.uk/index.php?page=22 They have a good bit of fanasty stuff too. ...I might now have to get myself an EDFS Yamato, paint it up as the Soyokaze, and field it as a counts-as Dauntless, Lt. Cmdr. Tylor at the helm. What could possibly go wrong? Honestly, I don't understand some of these companies with GW prices or more on their stuff. I don't see how they compete with the Industry standard if they don't undercut the prices. I thought they went out of production - are they still making them then or is this old stock?? Thats all old stock. On his main page the person selling explains that he bought all the stock whent they quit production O_o. Ninja Magic has some cool stuff, theyre magnetics are pretty well known but they have some nice looking ships too with quite a few more in production. They have a lot of markers availabel too. Torpedoes, missiles, mines, and vairous other little bits that might might look cool on the game table.